It’s highly likely you have found us here as you are looking for a nice quality cover-up that you can wear to and from the water. Granted that there are a number of options you will find online however the challenge is that nearly all of them are not designed a) for warmth or b) to dry you down after your dip. So they can look great on but they fall short of the functional garment you need when you are doing your water activities. Enter our 100% cotton, terry towelling swim robes. Where classic cover-ups fail our robes excel. Terry Rich Swim Robes are made from the finest quality, 100% cotton towelling making them plush, soft, warm and most importantly highly absorbent. Designed and cut by expert pattern makers they also have the shape and style women demand and a set of simple and functional accessories. A large, fully lined hood. A full length zip in the front. A secure zipped waist pocket. An additional waist tie. Seams are double stitched and fully covered. Hanging tabs are standard. Hems are strong and durable. If you are a women looking for a garment to wear to and from the water you can be forgiven if you are little confused with terminology. Truth is there are many names given for this area of clothing. You may be looking for a swim parka or a squad jacket. Maybe you are searching for a boat coat or a swimming hoodie? Most of these garments are designed to offer warmth (or thermal insulation if you want to sound fancy!) for people before they compete in water competitions. They are usually made from a synthetic yarn that works very well for warmth and comfort. For the most part they are traditional jackets and hoodies with slight modifications for water environments including splash proof outer shells, longer length hems and large warm pockets. Unfortunately though none of them are designed to deal with actual wetness after water activity. Often their linings are non-absorbent meaning one must fully towel down before returning to them. Most are also not designed for style. They tend to be oversized, boxy and bulky. For professional athletes these characteristics may be perfectly acceptable. For the everyday swimmer or water sports lover however traditional swim parkas can be a little off the mark. Not only do we want a garment that will dry us off after our dip, we also want to look and feel smart on our way to and from the water. Herein lies the most significant difference between traditional swim parkas and jackets and our swim robes. 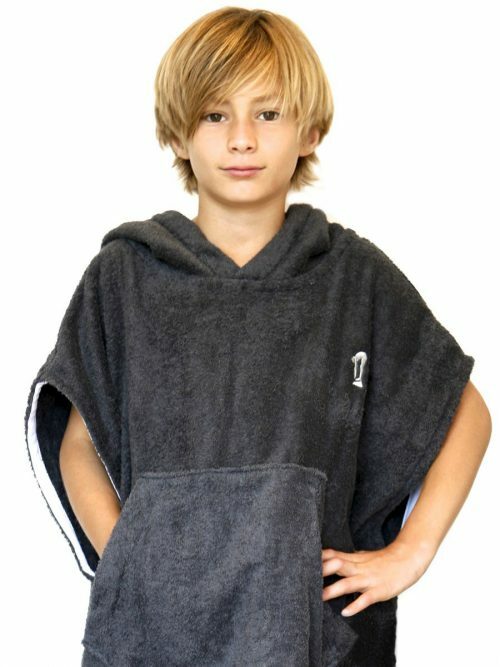 Terry Rich swim robes are cut and sewn from thick, absorbent 100% cotton towelling. The cotton towelling fabric achieves the warmth and comfort of the traditional parka style garments but critically is also highly absorbent. So they warm, coverup AND dry. Terry Rich Swim Robes can be put on straight from the water as they act just as a high quality towel would to dry you down. They are also designed and tailored by fashion professionals so they look and feel fabulous on. We are proud to have designed and produced these unique swim robes and encourage you to consider the benefits they offer for your water activities. If you are regularly in and out of the water then a Terry Rich Swim Robe will be a fantastic garment for you. They preform three main functions. 1. They are an attractive cover-up for your swimwear. You can wear them to and from the water without the need for other pieces of clothing. The sporty, full length, corrosion proof zipper makes them simple to slip on and of quickly. In practice our customers tend to dress in their swimmers at home or the office, slipping their swim robe over the top to travel to their water activity. After the water they tend to return immediately to their robe and head back home or work. As our robes are highly absorbant they also serve as a towel when on. The other benefit of swim robes as a cover-up is they offer fantastic protection from the sun and UV rays. A day at the pool, the beach or the lake need not end up with sunburn or endless reapplications of suncream to shoulders, arms and legs. Terry Rich swim robes are perfect sun cover-ups and are wonderfully soft and comfortable so you can stay in them all day. 2. Swim robes keep you warm. Many swimmers and other involved in water activities start early in the morning or get out late in the evenings. Our plush swim robes will keep you warm and toasty on the way to your swim as well as on the way home. The thick 100% cotton fabric, whilst breathable, is also wind proof. The full length arms, double front pockets and oversized lined hood offer plenty of snug cover-up to escape the cold. 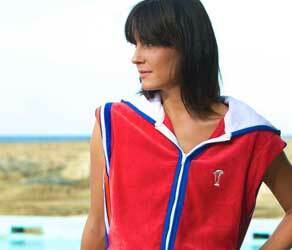 Our swim robes are also popular with women who swim and exercise in cold conditions or year round. In their words, they become their winter swim ‘uniform’. 3. Terry Rich Swim Robes also dry you. Drying you is probably the most important and unique function of our swim robes. Our swim robes are made from the highest quality, thick and absorbent 100% cotton terry towelling. So they are a robe that will cover you up and keep you warm but they also perform just like the finest of towels to dry you when you slip them on and move around. We make them from thick towelling so they don’t get wet through. You can slip them on and be on your way without the need of another towel. This is unique to the swim parka and swim coat market. To our knowledge our robes are the only ones designed to also dry you. If you are a regular swimmer, kayaker, surfer or water aerobics(er!) then you will appreciate this critical functionality. Water sports and activities for which Terry Rich Swim Robes are perfect include swimming, rowing, kayaking, diving, snorkelling, surfing and body boarding, water polo, water aerobics, water skiing, triathlon, canoeing, rafting, wake boarding, SUP, windsurfing and sailing. They are also very popular for spa trips. Basically any activity where you are getting in and out of the water or on equipment that exposes you to getting wet. And if you are changing in and out of your swimmers in publin locations (such as in a car-park or by a pool side) then our swim robes are the perfect changing robe. And don’t forget them for the resort pool deck or cruise liner. We have known customers to live in their Terry Rich robes whilst on summer holidays and why not. They offer lots of styling options to take you from your morning dip to the evening wet bar in style! They are also perfect for a walk along the shore or a day running errands. The advantages of a Terry Rich Swim Robe versus similar products. The single biggest advantage of a Terry Rich Swim Robe is it’s ability to dry you. There are any number of garments one can wear to and from the water to cover-up and keep you warm. But it is only with a 100% cotton towelling swim robe that you can go straight from the water to your cover-up and get dry at the same time. This makes a huge difference, especially if you are a regular in the water. With just your swimmers and your robe you are ready to go. An added feature of our swim robes is a secure zip pocket so you can stow your keys, watch, phone and other valuable safely in your robe while you are in the water. So everything you need is secure and tidy wrapped up for when you get out.